I've been working on some hoodies for the shop's grand opening. I made a 100% cotton jersey knit hoodie with fully lined hood for part of a custom order. I had a really great response to it so I've got a few on the go for future stocking. Three are blue with yellow lined hoods just like the Ramona outfit. One is blue with a brown lined hood, and four are brown with blue lined hoods. 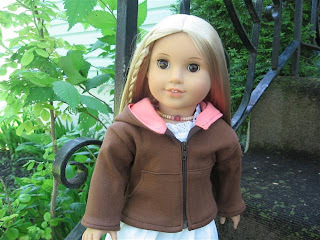 I made a brown one with coralish pink lined hood for my personal collection. The blue jersey fabric is very nice to work with, but the brown is an interlock knit so I had to alter my first example after it was completed. It stretched out and the finished product was miles too big. Fabrics can behave in such different ways. I will make appropriate adjustments on the remaining 4 brown garments before they are sewn. Custom movie outfit for Sonali.